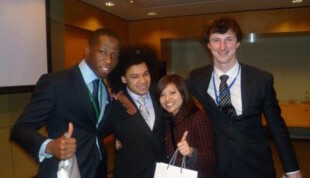 A team of budding student entrepreneurs have won a £500 cash prize, provided by UCLB, in the UCL Apprentice Challenge 2012. The competition, hosted by Ernst & Young at its London headquarters, saw the eight teams of students selected by the UCL Entrepreneurs Society battling it out in a series of challenges to be crowned ultimate victor. The day saw the teams in a frantic dash around London completing three different challenges: negotiation and haggling to get a list of items as cheaply as they could, including a Russian flag; starting up a business to make as much profit as possible in an afternoon – with ideas ranging from shoe-shining to a photo stall with a giant shark outside London Aquarium – and finally, a pitch for a market-leading bag to UCL Business and Ernst & Young judges. Competition was fierce – and all the teams put on a performance that Lord Sugar himself would have been proud of – but it was Team Alpha, the most consistent team throughout the challenge, who were the eventual winners. Team Alpha will now represent UCL at the London Apprentice Challenge, with the final taking place on campus on 1st March. They’ll be taking on teams from LSE, Kings College, Royal Holloway and Imperial College for the title of ultimate London champion.